Asmyco, the Helsinki-based app developer / industry analysis advisory firm founded and led by a longtime Nokia manager, has just published a new report on its blog with notewrthy data on the increase in iOS downloads by device. The company reports that more than 60 apps have been downloaded for every iOS device sold. 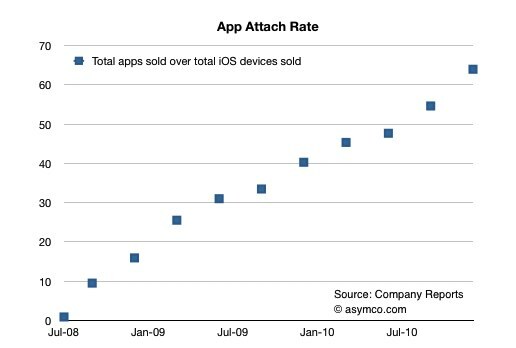 That’s up from 10 apps downloaded for every iPhone/iPod touch in 2008, says Asmyco. So how did the firm get to that number? As the Apple App Store approaches 10 billion total downloads, App downloads are increasing at a faster rate that iTunes music downloads (of course, not all iTunes users are getting their music from iTunes). Asmyco then determined that around 30 million Apps are currently being downloaded per day. The firm then divided the cumulative apps downloaded by the cumulative number of iOS devices sold, which includes iPhones, iPads, and iPod touches. Asmyco says that from that equation, each iOS device sold has downloaded more than 60 apps. Of course, much of this information is subjective, considering Apple doesn’t publicly update its total number of iPhones, iPads and iPod touches very often. And as more devices are sold, more Apps will be downloaded.